Jim Hamilton never fails to prove an unlikely pillar of wisdom. He lumbers before the waiting press, a lofty brute with arms plastered in tattoos, a thick auburn beard and a reputation for rashness that is not entirely unwarranted. The 32-year-old has always relished the gladiatorial edge to the game, thriving on physical dominance from the second row. Indeed his debut from the bench at home to Romania back in 2006 rather set the tone. After the sort of ruck-adjacent scrap in which he is known to indulge, Hamilton found himself clutching a fistful of jersey belonging to a diminutive Romanian back. The irate opponent cocked his arm, primed to strike the offender, before he turned and stared up at the navy-clad monster towering over him. Eyes wide with alarm, he let fly a most charitable blow to the chest while frantically summoning the referee. Today, in a crowded hospitality box that seems all the more cramped for Hamilton's immense stature, he settles down and delivers another physically striking lesson in not judging a book by its cover. "It sounds like a broken record me sitting here and saying these things, but we're trying hard, we're trying to change that mould," he stresses. "I'm still here because I believe in what we're doing; I believe that mould's going to change soon." 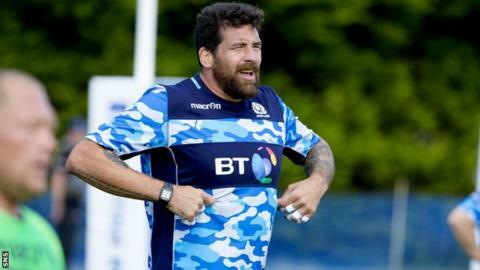 Hamilton's nine-year Test career has spanned a barren period for Scottish rugby, and in that time, he has given numerous poignant emphases to improvement and growth. There is a sense that had more shared his unshakeable mental constitution, Scotland might have emerged more favourably from a cornucopia of "ones that got away", and suffered less in the way of complete cerebral capitulation. "I understand that expectation's sometimes difficult in terms of media, supporters, because the success hasn't been there," he says. "That's a difficult thing but I think there were times in the Six Nations where you could see where we were going - the word unlucky's been bandied about how many times; should have, could have but ultimately it's a results-based business." The Six Nations: that brutal arena of raised hope and perennial hurt for Scots. In Hamilton's time, it has all too often proved a predictable and painful process. A tournament whitewash was capped in March by a 40-10 trouncing at the hands of Ireland, whose clinching of the title and celebration on the Murrayfield pitch left Scotland smarting. They have the chance to avenge that humiliation in Dublin this Saturday - albeit in far less significant circumstances - for the first of four Rugby World Cup warm-up matches. "The last game we played here against Ireland was unacceptable," Hamilton rumbles. "It's a great opportunity to play against the same team that embarrassed us on our home turf. "They're ranked second, and they're ranked second for a reason. They're a quality team; they're the champions of the Six Nations. "They did play well against Wales at the weekend. There's only so much we can look at the opposition, we have to focus on what we're doing and the journey that we're on. "It was tough - sometimes you have to look back to look forwards and we've gone through some of the video. It hurts, it's difficult, but you move on with your club. "I went back to Saracens and we had a long season to finish there, but it's always in the back of your mind they're a team that come here on your home soil and won the Six Nations at Murrayfield and that was difficult to take." Hamilton has spoken before about impressing himself on his youthful counterparts, leaving a legacy for the Jonny Grays and Grant Gilchrists who could well keep him from this year's global showpiece. "It's just little bits of experience - it isn't, 'I've been here, done this, look at me, I've got this amount of caps,'" he explains. "It's putting an arm round a shoulder before a scrum, being in there with (prop) Jon Welsh and working on our small units. "Success breeds success. One of the things I've learned a lot from being at Saracens is being able to operate in those pressure situations - when you're losing and when you're winning comfortably. "You have to draw on the fact we've got a lot of guys involved who have played in those games." It's a strange notion that Hamilton, who claimed an Aviva Premiership medal just months ago, may find it harder to get a Test jersey in the coming months. However, it may be his value to Scotland has shifted from his aggro on the field to his drive and influence off it. "We'd be very naïve to look any further than winning [against Ireland]; we struggled in the Six Nations in terms of performance," he says of Saturday's match. "We need these performances going forward for confidence for the team, for the players and also for the supporters that have given so much over the years that I've been involved. We want to give them something back. "There's a lot of emotion when it comes to a Test match for Scotland - I'm hearing it's a warm-up game, but we're treating it as a Test match to go out there and win."